Known as the “Father of the American Revolution” and the “Firebrand of the Revolution,” Sam Adams was arguably the most effective verbal rabble-rouser in American history. 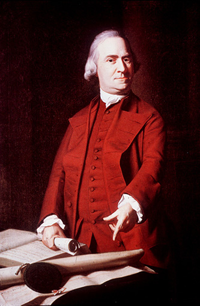 He was a leader in the events leading up to the American Revolution, helped to found the Sons of Liberty, formed , Boston’s Committee of Correspondence, was a member of the first Continental Congress and signed the Declaration of Independence. He helped to draft the Articles of Confederation and served as President in the Massachusetts Senate before becoming the Lieutenant Governor and subsequently the Governor of Massachusetts. "We have this day restored the Sovereign to Whom all men ought to be obedient. He reigns in heaven and from the rising to the setting of the sun, let His kingdom come.